We developed CrushErrors.com to find needles in "digital" haystacks. Similar calculations are impossible in Microsoft Excel and Google's OpenRefine. Today, we introduce the easy-to-use Self-Serve version at https://CrushErrors.com/pay-as-you-go. This article addresses a problem that accountants and data users frequently experience. But, honestly, they don't think about it exactly in the terms presented below, largely because it is very hard to solve manually and even very hard for Excel. There is a solution that makes it much easier that is presented at the end. If you have two sets of data that need to be reconciled, like a bank reconciliation or even more complex data, there are perfect matches, less than perfect matches, and no matches. First consider a super simplistic example. Let's say each side only has three columns: check number, date, and amount. For this example, they correspond to the letters A, B, and C. Ideally you would want to match on all 3, so ABC on one side exactly equals ABC on the other side. However, sometimes the check numbers could be different, but the dates and amounts could match. Or Let's say the check numbers match, but the dates don't. Unfortunately, without some very intense VBA programming, there is no way to automatically cycle through every combination. Below, we're going to go through 2 combinations. Instead of just the 3 fields shown in Table 1, we're going to have 5 fields (ABCDH) that define the perfect match and 1 date (C) field that represents the imperfect matches. There are 32 different combinations of 5 columns, but after you see the complexity to any single combination, you'll see why we're only looking at 2. There is one more column in Table 2, in column J, that describes the quality of the match. We'll get back to this. So now all of the data is in place and the final connection needs to be made. We need to put in the "Quality of Match" data into Tables 2 and 3. We need to say whether it's a PERFECT match, meaning all key fields, or just Date matches. Or no match. Remember that theoretically there could be other combinations, but that's too much manual work. SUMIF(internal[Date],[@[Date Posted]],internal[Amount]) =   SUMIF([Date Posted],[@[Date Posted]],[Amount]),    "JUST DATES"
Here is column G in Table 3. The formula is almost identical to the one in Table 2. The only difference is that in Internal data, the date field is called "Date", unlike the Bank data in Table 2, which is called, "Date Posted"
SUMIF(bank[Date Posted],[@Date],bank[Amount]) =   SUMIF([Date],[@Date],[Amount]), "JUST DATES"
If the SUM of the "Most Fields" is the same on both sides, then it's a perfect match. If the SUM of the DATE fields match on both sides, then it's a match based on the dates. The IFS function makes it easy to prioritize the perfect matches. There is no way to automatically cycle through every combination of matches. Reporting results are sloppy because you cannot see what matches on left equal matches on the right. If there were thousands of matches, it would be very hard to visualize results. here is no simple way to notate scattered matches. Are you kidding me? There must be a better way! There is! Doug Schiller created CrushErrors.com to solve this problem, along with many others. Here are the steps with CrushErrors.com. Respond to Crush's question that the signs are reversed (that's because a bank looks at a deposit as a Credit but internal records show the same number as a Debit. But Crush knows this and makes that the default setting. Press the Power button to cycle through ALL ... ALL ... combinations. It's done. But now you can look at the reports to see the results. CrushErrors.com found, for example, the match for the payment of $1,022.00. Our Excel model did not find that match because the date was different. Crush found it because the amounts were identical. I recommend that users with any kind of reconcilation problem consider using CrushErrors.com. It solves very basic problems experienced by many people every day. I've added so many new features since the last time I blogged, but this latest one is really insane. Now users only have to upload their data and the AI engine will figure out what the user is trying to do. Crush will build an App that matches the specific needs. It does not work 100% of the time, but it will work with the most common problems, including bank reconciliations and comparison of trial balances, etc. There's also a button to scan the App store to see if there are compatible Apps that match the uploaded data. Crush just got MUCH easier and more powerful. Other features added since the last post include a complete Matching system. Users can match transactions, star them (1 is a poor quality match, and 5 stars means it's perfect), and notate them, and report on the system. There's also a file save and file open feature. Users can now save their work to continue at another location. Or delegate work to others. Or just record the history of the Crush session. Since I started with the Web version almost 2 years ago, there have been popup windows with different bits of information. 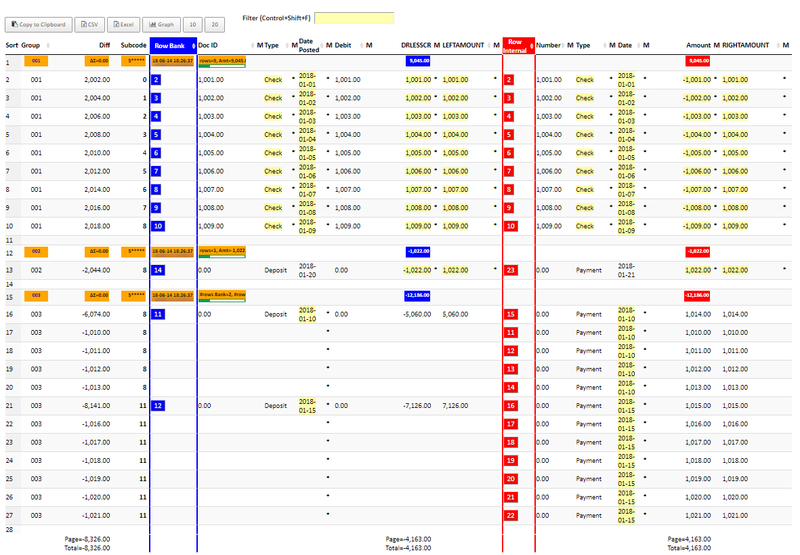 For example, you can click on the NUMBER of rows of transactions for a vendor. That pops up a window the detail of the rows. They can be exported to CSV, but that's a separate issue. The problem is that there could have been MANY popup boxes all over the place on the screen. The user would have to manually organize it by resizing each window and move it to a convenient location. But now, I added a way to minimize the popups to a dock at the bottom so they're very very organized. They could even shrink the popup so only the title bar appears. That's also very convenient. This has been on my to do list all of 2016. It turned out better than I expected.